Michael Bennett, Earl Thomas, Deshawn Shead and Mike Morgan will return Sunday against Carolina. 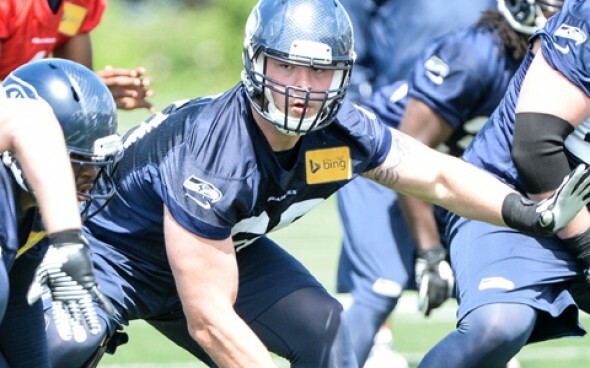 But return of C Justin Britt is an even bigger deal. Also: Panthers LB Luke Keuchly out. A nearly full complement of Seahawks defensive regulars will greet QB Cam Newton and the Carolina Panthers Sunday (5:30 p.m., NBC), with the returns to health of DE Michael Bennett, FS Earl Thomas, CB DeShawn Shead and and LB Mike Morgan. In what might be the key addition on offense, Justin Britt will return to start at center to help settle the leaky offensive line that gave up six sacks in Tampa Sunday. Britt’s one-game absence (sprained ankle) caused coach Pete Carroll to be more honest after practice Friday about the dropoff to rookie C Joey Hunt that contributed to the 14-5 loss at Tampa. “I have to tell you now, after the fact, there was a loss of just a sense of chemistry in the kinds of things that you count in an offensive line — that showed up some,” Carroll said. “It was no fault of anybody’s. We couldn’t do anything about it. It was just the connection Justin has, as kind of the captain of the group. Regarding Bennett, Carroll jokingly called him “highly questionable,” referring to his personality, but said he would return to his job as havoc-maker. Bennett indicated Wednesday that he would be playing sore after arthroscopic surgery repaired damage to his left knee from a cut block by Falcons LT Jake Mathews. He played the next week but decided the surgical fix was needed. “Surgery never feels good when someone is taking a knife and slicing your body,” he said. “But I think overall, it will be better in the long run. The Seahawks will be without No. 4 receiver Paul Richardson (hamstring) and thin at backup linebacker, with Brock Coyle (foot) and Jordan Tripp (thigh) out. TE Luke Willson, DT Damontre Moore and rookie RB Troymaine Pope (ankle) are on the questionable list. Carroll was excited about the week of practice by RB Thomas Rawls, who returned after an eight-week absence (fractured tibia) to so-so results in Tampa. “He just wasn’t as freed up,” Carroll said. “He looked like he was a little bit heavy-legged, maybe just from the work and the banging. It took that week and this week to get right. He looked terrific all week long. I think we’re going to see him really close to his best. Carolina is missing All-Pro MLB Luke Kuechly, still out with a concussion. Also ruled out were starting RT Daryl Williams, sack leader DE Mario Addison and SS Kurt Coleman. WR Kelvin Benjamin, who missed last season’s games with Seattle, has a shoulder problem but will play. Former USC RB Joe McKnight, who had a four-year NFL career, was shot to death in New Orleans Thursday in an apparent case of road rage. Carroll, who recruited and coached Knight from 2007-2009 at USC, where he had a 6.4 yards per carry average his junior year before being drafted in the fourth round by the New York Jets, was shaken. “It’s a real tragedy for a young man,” he said. “All of us that knew Joey and brought him on and recruited him, he was a very special kid. He had some special difficulties coming along, growing up, and we all knew about it. We just regarded the guy that he was, knowing the course that he had traveled. Carroll said he talked with McKnight three weeks ago. “I just felt terrible with this news that I wasn’t able to do something that might have kept him in California,” he said. “He was in Pasadena at the time, and it just personally hit me that I wasn’t able to do something that might have made a difference to keep him away from where he was. Britt got lucky getting moved, a solid center fetches a pretty penny on the open market. We will all be sad to see him move on. A Seahawks fan better hope he doesn’t. I thought they should have kept Sweezy, so I’m afraid my hopes don’t count for much.